I’m staying at my in-laws’ place for a few days and I couldn’t help but notice that the airing cupboard in the spare room has a handle on the inside of the door. Maybe it used to be a room for a goblin. For the few who care about such things, I’ve recently moved this site to a Virtual Private Server, which gives me a lot more control over how things work. In the spirit of change which this has brought on in me, I’m contemplating changing the WordPress theme to something a little more interesting and, dare I say it, modern. Hopefully it’ll encourage me to write here a bit more often. I know I’ve said it before but I really do intend to post here more frequently. It just seems that life gets in the way sometimes, and then I’m so tired that it’s hard to find the mental energy to compose posts. If I had it in me I could, for instance, tell you about the KT Tunstall gig at the Barbican last Monday, which was fantastic, by the way, or the visit to the Harry Potter Studio Tour on Tuesday, which was wonderful and breathtaking and fun and just thoroughly enjoyable. So, I’m going to try to do better. Promise. I’ve struggled for years, on and off, to keep some sort of diary/journal thing. Every attempt has been a failure. I’ve tried regular dead tree diaries, Evernote, Google Docs and more. The latest go is via a piece of software for the Mac called Day One, which seems very easy to use. It provides a nice little title bar widget for quick updates and a lovely main interface which is attractive and clutter-free. So far, I really like it. The real challenge, though, will be to see if I can keep it up once I’m back at work. I’ll let you know. Juliet’s out tonight so I’ve taken the opportunity to have a quiet night in. I’ve fed and changed Max and put him to bed where, true to his usual form, he’s gone to sleep quite happily, I’ve eaten, phoned a friend whose birthday it is tomorrow, watched a silly film (Four Lions, if you must know) and generally had a pretty nice time. Max is growing fast. I’ve heard parents say that babies change rapidly but this is the first time I’ve experienced that for myself, and they’re right. You turn your back (or go to work) for a moment and they’ve learnt to do something new. Something such as rolling over, which is of no interest whatsoever to anyone else but is utterly thrilling for the doting parents. I’ve been reading Bad Pharma by Ben Goldacre in my spare moments and I have to say that it’s simultaneously horrifying and unsurprising to an old cynic like me. If you have any interest at all in how the medicines you take get tested, marketed and prescribed, it’s well worth a read. It helps that it’s also very easy going, considering the subject matter. There’s probably more that I could be adding here, some of it possibly even interesting, but tiredness has now overwhelmed me and it’s time for bed. Good night, world. At the weekend Juliet and I decided to go and have a poke around at the London Tattoo Convention in Wapping. My friend Mark had let me know that he was going to be there and I was looking forward to meeting up with him. Unfortunately, thanks to the dreadful user interface in the car’s sat-nav, we were led way off course and had to spend hours struggling through heavy traffic. This meant that we didn’t get to see Mark. On arrival, we discovered that the only cash machines were in the venue and we couldn’t use our debit cards to pay the rather steep £30 entrance fee, so we popped to a nearby garage to get some cash and have a quick and much-needed burger for lunch. Once we were in, we had a good wander around but, to be honest, weren’t all that impressed. Much more entertaining was sitting down with a drink and doing some serious people-watching. The journey home was very slow, again thanks to very heavy traffic. At least we were able to break it up with a quick stop at the services to pick up some food and some milk. 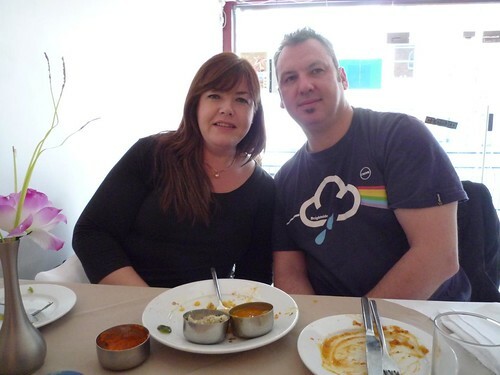 On Sunday we had a nice long lie in before cycling into Rickmansworth for a spot of lunch. We decided to take the dog out for a walk in the woods, and were very glad we did. 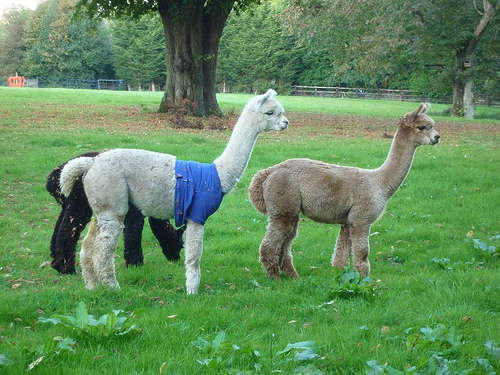 Not only was it delightful out, but we came across three alpacas, which were recovering from dog attacks. We spent quite a bit of time leaning on the fence watching them, while the dog just stood and looked faintly bored. The evening was spent relaxing in front of the TV, which is a pretty good way to end a weekend, if you ask me. Juliet is away at the moment in Nashville for an Alison Krauss concert, which leaves me at a very rare loose end this Saturday. I’m not entirely sure what I’m going to do with myself, apart from having a very long lie in. I suspect that some DVDs may get watched and music listened to. There’s always my book, too. Possibly some housework may get done if I get really bored. On Sunday, assuming that Hurricane Irene doesn’t bugger things up completely, I’ll be meeting Juliet at the airport and accompanying her home, where I shall look after her while she gets over her jet lag. This will, I suspect, spill over into Bank Holiday Monday. We just might walk the dog or maybe do a spot of cycling, but probably nothing too energetic. So, that’s the plan for the weekend. It’ll be lovely to get some rest – I’m feeling increasingly in need of some R&R, so I suspect it won’t be all that long before I take a week or so off work and give myself over to some serious laying about. Today I went into a Computer Exchange shop in order to sell some games I haven’t played in a very long time and probably won’t want to play again. Foolishly, I assumed that I’d simply be able to hand them over and take the cash, but apparently it’s more complicated than that. Before I can sell them anything, I have to open an account and before I can open an account I have to provide two forms of identification, one of which must include a photo. So, I have to try again tomorrow, taking my passport and a recent utility bill with me. All for (probably) less than ten quid’s worth of games. I was (and am) strongly opposed to the idea of ID cards, but I have to confess that even I thought, albeit momentarily, that it would have been handy in this particular situation to have had one. Then I came to my senses and remembered just how deeply flawed the whole idea is and gave myself a mental slap for being so stupid. It does go to show, though, how easy it is to persuade the general public of the usefulness of such a system. On Saturday Juliet and I, accompanied by her mother, went to the Living Crafts fair at Hatfield House. We were pretty hungry when we arrived so we headed straight for the food area, where Juliet’s mum bought us each a pork baguette, which was delicious. Afterwards, we had a good wander around the stalls, picking up some really lovely sausages and cheese, among other items. We also really enjoyed looking at the goats and the barn owl that were present, and chatting to the guy on a stall that sold products made from dog hair (yes, really!). All-in-all, a good day out. Having discussed the matter at the weekend, Juliet and I have decided to live together. This will necessitate both of us moving as my studio flat, while great in many respects, just isn’t big enough for two and she’s currently living with her parents. I’m not particularly tied to Walthamstow and as long as I can get to work reasonably easily I really don’t mind too much where I live. Essentially, the whole of the Greater London area is fine. I’ve had a look at properties online and it looks very much as though we’ll be able to get a decent one or two bedroom flat within our budget, which would be great. Living in a studio is all very well but it’s not ideal when you have guests. Our other requirements are quite modest: somewhere to park, a reasonably safe area, ideally not ground floor and ideally with access to green space. There’s no desperate rush to find somewhere either, as we can both stay where we are pretty much indefinitely. This gives us the opportunity to look for somewhere that we really like, without having any pressure on us. Am I happy about all this? I’m ecstatic. I’m currently off work with a pretty nasty cold. Not the end of the world, I know, but it still feels very unpleasant. It started coming on on Sunday night and by Monday morning I felt ghastly. So, all this week so far I’ve been kicking around my flat reading, watching films and feeling like crap. I’ve also been feeling pretty guilty about not being at work. I know that it’s stupid to go in when you don’t feel up to it and I really, really hate people who drag themselves in when they’re contagious and spread their nasty diseases to everybody else, and yet I can’t help but feel bad for not being there. I like my job and I like the people I work with, and I feel bad for letting them down. When I worked in jobs I hated many moons ago, I felt much less bad about it when I was ill. I put my feet up and read my books with a clear conscience. These days I’m fortunate enough to have a job that makes me feel crappy for not being there. I should feel good about that and I guess I do. 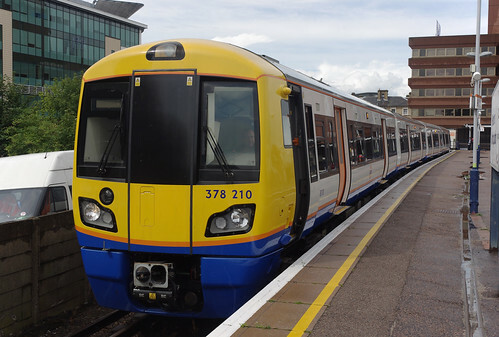 On a couple of occasions recently I’ve arrived at a London Overground station on time, only to find that my train arrived early and, much worse, left early and I’ve missed it. This is, as far as I’m concerned, even more frustrating than the trains running late. Surely, if a train arrives at a station early for some reason the driver should be made to wait at the station until the scheduled departure time, so that those of us who arrive just in the nick of time aren’t made to wait on a cold, windy platform for the next one. For the past few days I’ve been off work with some kind of ‘fluey thing – sore throat, cough, headache but not snotty, thank goodness. It’s a real pain, especially as I’ve had a fair amount of time off sick recently. I’m sure they’re starting to get a bit pissed off with me back at the office. On the other hand, it would be foolish of me to haul myself in when I’m feeling this lousy. I did that on Mondayband it only made me feel worse. On the plus side, I’ve had the opportunity, in amongst bouts of coughing my lungs up, to catch up on my reading and to watch some good films. Not to mention the joy that is BBC Radio 4, which has kept me amused, entertained and informed throughout this period of illness. With a bit of luck I’ll manage to recover sufficiently over the weekend to get back to work on Monday. No doubt there’ll be a huge backlog of email to wade through. I’m currently just over half way through a week off work. I decided that it would be a good idea to take a break because I’m quite tired, I needed to use up some of my holiday allocation and it was my birthday yesterday. So, what have I been doing? For the most part, not a lot. I’ve watched quite a bit of TV, done a fair bit of reading and played some Scrabble. So far it’s been exactly what I needed. Relaxing and simple. My mother very kindly sent me some money for my birthday, so I spent some of it on something I’ve wanted for quite some time – a crossbow. Only a small one, but I reckon I shall still have some fun with it. Hopefully, when I return to work on Monday I shall be able to throw myself back into the fray with gusto. That’s the plan, anyway. Some years ago I was at Paddington station, waiting for my mother, who was visiting for the weekend. Hanging around by the ticket barriers I became aware of a young girl nearby who was having a conversation on her mobile phone with her boyfriend amidst great sobbing. Being a naturally curious person and having nothing else to do, I listened. It soon became clear that she had planned to spend the weekend with her boyfriend but had arrived late and missed her train. She’d asked if she could use her ticket to travel later and had been told that this wasn’t possible and she didn’t have the money to buy another ticket. Her distress was so overwhelming, her devastation at this turn of events so utter, that my heart went out to her. I found myself wishing that I could help. If I’d had the money I’d have happily bought her a ticket, but unfortunately I had nothing. I was therefore forced to watch her trudge miserably home, her weekend utterly ruined. I’ve thought of her many times since then, and wondered whether she found a way to get to wherever it was that her boyfriend lived. I find myself hoping that things worked out for her. Sometime I’d like another chance to help someone in similar circumstances. I’ve been using Google Latitude for some time now, and have built up quite a bit of history. I’ve been having a play with the Location History Dashboard, which is quite scary. It’s correctly guessed which location is home and which is work and can tell me how much time I spend in both places, but it also shows me which of my friends I’ve visited and when, and can also show me a little animation on a map, showing my movements over any period of time. I like it but it’s somewhat freaky. Of course, the real crux of the thing is to figure out something useful to do with this information. I keep thinking that there must be something but what exactly that is eludes me. Any suggestions? I really dislike littering in all its many and varied forms, but the form of it that really gets my goat at the moment is newspapers, particularly the ever-increasing number of free ones, left on trains. You want to sit down in a crowded tube carriage, there’s a free seat, but it’s got a paper on it. You’re not a litterer yourself so simply throwing it on the floor feels wrong so you try to balance it against the window. Inevitably, it won’t stay there and falls over your shoulder into your lap or down between your back and the seat from where it’s almost impossible to remove it without elbowing your fellow passengers in the face. I’m not sure what the answer to this problem is. Perhaps, on seeing someone leaving without the paper they brought onto the train, everyone else in the carriage should refuse to let them out until they return to their seat and get it. Perhaps someone should roll said paper up and give the miscreant a good whack over the head with it first. However it’s done, we need to put pressure on these anti-social gits to take their litter with them and put it in the bin. Preferably the recycling one. It won’t surprise those who know me when I say that I hate football. This isn’t something new, I’ve always felt this way. To clarify a little, it’s not the actual game that I detest, more all the fuss and hype that surrounds it. Is it really that important who wins? Will your life never be the same again? Even at my most sports-fanatical I’d never claim that Valentino Rossi crashing out of a race could force me to take to my bed and spend the rest of the weekend wallowing in misery, so why do so many football fans behave as if their sport matters so much? Anyway, the point of this ramble is that despite my loathing of the national sport and the consequent dreading of the World Cup that was my initial reaction, a thought has occurred to me. While the England matches are on, especially if the team make it through to the later stages of the competition, the streets will be blessedly, delightfully empty. I shall be able to amble around London without having to keep stopping or changing direction suddenly. I shall be able to get a seat on the Tube. As long as I’m safely off the streets by chucking out time I’ll be able to pretend that some sort of ghastly, Survivors-like plague has struck and I’m one of the lucky few who’s still around. So, unlike my behaviour in previous years, I shall be cheering the home side on (mentally, at least) with as much gusto as the most excitable enthusiast can manage. And if they make the final I shall be utterly delighted. I was made redundant just before Christmas. It wasn’t unexpected; in fact I had a couple of weeks’ garden leave before the redundancy was confirmed. I decided to take a couple more weeks over over the holiday period to relax and contemplate my future, which I think was a good idea. As of yesterday I’m actively seeking employment as a Web Developer, working primarily with PHP and MySQL, so if you know of anything or would like a copy of my CV, please get in touch. Update: I have now found a job, which I start on Monday 18th January. I’m very glad to have found something so quickly and I’m looking forward to getting my teeth into it. I hope everyone had as good a Christmas Day as I did. Good food, plenty of booze and great company – what more could you ask for? I also managed to get some lovely presents. Vally bought me something I’ve wanted for ages – an alarm clock from Voco, which features the voice of Stephen Fry and provides a lovely, gentle way to wake up in the morning. I tried it out today, of course. I have to play with my toys. Today I may be having a wander around the shops before indulging in more nice food and drink. It’s a tough job but somebody’s got to do it. Last Friday Vally and I met up after work and went to the Natural History Museum for a mooch around and a glass of wine, after which we found a restaurant and had a bite to eat. On Saturday I bought a webcam (well, it was about time, really), did a bit of shopping and spent some time at Vally’s house. The evening was spent relaxing and being generally lazy. This is my personal website and, therefore, all opinions expressed in posts are mine alone, not those of my employer, significant other, friends, family or intestinal fauna. Likewise, commenters' opinions are theirs and not necessarily mine or anyone else's.